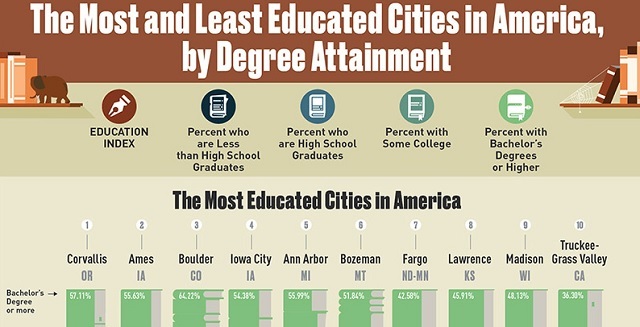 The Most Educated Cities in America #infographic ~ Visualistan '+g+"
Education is a hot topic across the United States these days. From the increasing costs of college, to the state public schools are in, to even how healthy the food being served at school is. But which cities in America are considered to be the most educated? Many would expect to see bigger cities sitting at the top of the list, but that isn’t necessarily the case. Using 2017 census data and taking four different factors into consideration, this infographic from TitleMax breaks down the top 10 most educated and the top 10 least educated cities. The ranking is based on degree attainment so the four factors mentioned above include the percent of people who have less than a high school diploma, the percent of high school graduates, the percent with some college, and the percent with a bachelor’s degree or more. It also shares the top 10 cities with the most people with a bachelor’s degree or higher, and on the flip side the 10 cities with the most people with at least a high school diploma. Which side of the educated spectrum does your city fall?